Welcome back to Destrehan Plantation! There is a bounty of food laid out for your pleasure! Faux food, that is! The first couple of pictures are from the kitchen inside the home on the first floor. This is probably where they assembled the food for serving since there is also a kitchen that is unattached to the home. Now, on the dining room. I don’t have a lot of pictures of this room because the light was not good. Also, we were with a group of very young couples who seemed to want to rush though so I didn’t get as many pictures as I wanted to! Homes built this early on where not as fancy as some of the later built homes. Plus, we have to realize that in 1787 there weren’t any furniture stores to buy from! On the other hand, for this time period, they were lucky to be so close to the Port of New Orleans where they could have items shipped in from France. The rest of the pictures are from the movie Interview with the Vampire, which was filmed here at Destrehan. I’m pretty sure this is Louie’s home, where the vampire Lestat, played by Tom Cruise was having dinner with him. 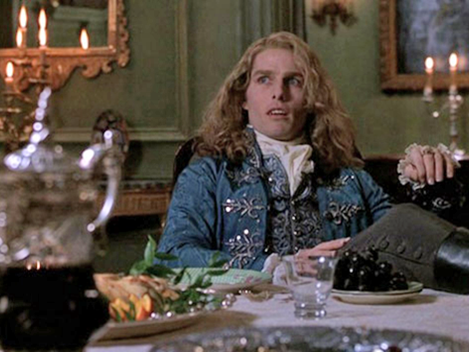 This is Lestat again after Louie sets fire to his home after informing his slaves that he is the devil! Did you know that Anne Rice actually wrote the book, Interview with the Vampire and that she is a native of New Orleans herself? Brad Pitt must have really liked the area himself since he and Angelina Jolie also own a home here. Hmmm, I think there’s another post in here somewhere! If you click on the pictures, it will state you to the original source. If you missed Part 1 of Destrehan Plantation, click here. Thanks so much for stopping by! I hope you enjoyed the tour! What a beautiful setting. Thanks for taking us along. Found you through Savvy S. S. and so glad I did! I've visited this plantation house years ago and loved looking at your photos. What nice memories! The white and gold china is beautiful, especially the tureen. I love visiting old plantations. Coming from the northeast, the first time I went to one I couldn't believe the kitchens were in a separate building, thinking it would be pretty cold during the winter months carrying the food to the main house! We laugh about that now. I love visiting these historic villages.